Groovin' in the kitchen, dancin' in Missoula. Remember awhile ago when I made bagels? Yeah, those were delicious. I noticed something, though. They had the perfect hard on the outside, soft on the inside texture for the first few days, and then after that they became…chewy. And not in a good way. They were rubbery! There’s no way these could be eaten without toasting them first, because you’d literally have to tear them apart with your teeth like a dog tearing a shoe apart. Even after toasting them by the end, they were a bit rough on the jaw. 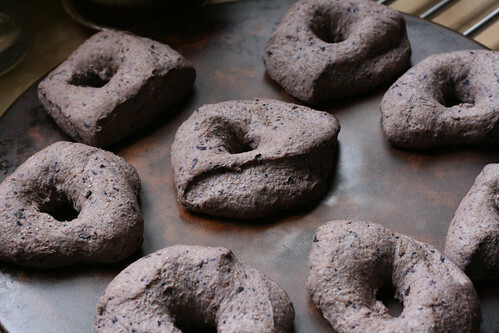 I’ve made them a few times since then, but I wasn’t brave enough to swap out bread flour for whole wheat flour. I didn’t know how it would change the texture, and I was worried about making them any more dense. I’ve been super lazy lately, too. I think it’s the lingering cloudy/rainy/snowy/crappy weather around here. I know that seems like the perfect time to bake, but it’s supposed to be SPRING, and I’m just ready for some sunshine. Maybe I was just feeling a bit SAD. But then last week, the sun came out, and it was glorious! We played outside, we went for bike rides, I went running (outside!! ), we sat on a patio and drank iced coffee. I was suddenly inspired to try whole wheat bagels. I followed the same recipe as before, but swapped out two cups of bread flour for whole wheat. I’m never going back again! The only thing to try now is taking out all of the bread flour and using only whole wheat. Don’t worry, I’ll let you know how it goes. Combine all ingredients in a bread machine and turn on to the “Dough” setting. Once the machine is done, divide the dough into 8 equally sized sections. Gently roll them in your hands, and then push your thumbs through the middle to make a hole. Allow the bagels to rise for 30 minutes, covered, and in a warm spot. After 30 minutes, preheat the oven to 400F and bring a large pot of water and 2 tbsp of sugar to a gentle boil. Add the bagels to the water, one or two at a time. Boil for 30 seconds on one side and then turn them over in the water to cook for another 30 seconds. Place the boiled bagels on a rack to dry off, and then place them on a baking stone. When all the bagels have been boiled, bake them on a stone (or cookie sheet w/parchment paper) for about 25 minutes. I didn’t use the egg wash and topping method for the blueberry bagels, but if you want to see what that’s all about, you can read the first epically long bagel tutorial. Go ahead and just scroll to the bottom. I won’t cry if you don’t want to look at my bruised toenail again. 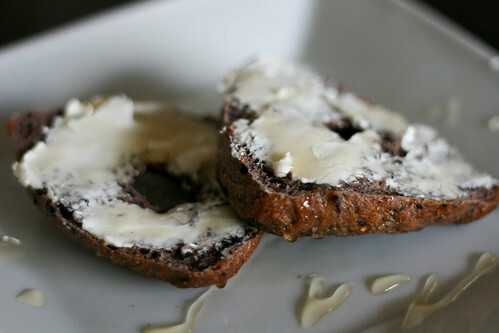 My son adores bagels with cream cheese and honey. But he actually adores anything with honey, so eat your bagels however you want. Thank you so much for this recipe! 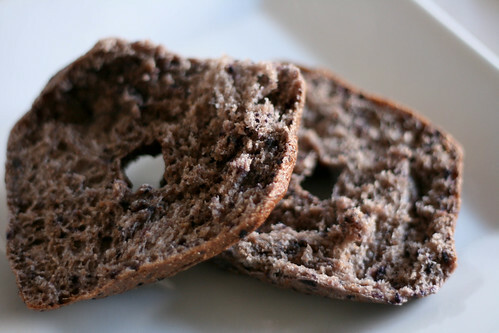 I have a bread machine and I definitely have to try this with whole wheat flour.